The government has scrapped a plan to raise electricity prices. Taipower had been pushing for an 8.21% hike starting October, but today its proposal was voted down 10 to 3 by a governmental review committee. 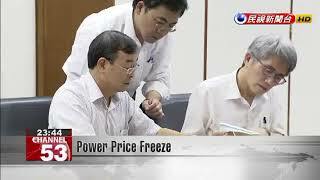 Citing the need to stabilize prices after recent storm damage, the committee ruled to hold the price at NT$2.6253 NT per kilowatt-hour until next year. Taipower is set to lose NT$4.5 billion Taiwan dollars in revenue due to the decision, and the committee said it will offset the loss using Taiwan's energy price stabilization fund. The committee also said it may authorize Taipower to enforce summer power rates earlier next year. During the review meeting, committee members proposed initiating higher summer rates in May, instead of the current June.